This is the first book by Miranda Kenneally that I have read and I absolutely loved it. Jesse is an eighteen year old country music star and Maya is a high school senior who is an aspiring musician. Her musical taste is more towards the 80's, so getting paired with Jesse for a job shadowing assignment by her principal was not nearly as appealing as it would have been for most girls her age. Jesse and Maya have a very awkward first encounter, but their day of shadowing turned out to be one of the best days of either of their lives. Picture Ferris Bueller's Day Off... Nashville style. Maya realizes how talented Jesse is and begins to really appreciate the musical advice he gives her. For Jesse...Maya is a breath of fresh air that he has desperately been needing. Life in the music business has caused him to isolate himself from everyone except his immediate family and managers. He has been burned so many times by his supposed "friends" that he has a hard time trusting anyone. Maya manages to show him that he can still have a life while maintaining his career. I haven't given a book 5 stars in a while, but this one was definitely worthy. I was completely engaged and actually finished the entire book during a lengthy travel day with my family. My husband even commented that I needed to get my head out of the book. Once I was finished...I still couldn't put it down. I was flipping back through to reread some of my favorite scenes and quotes. 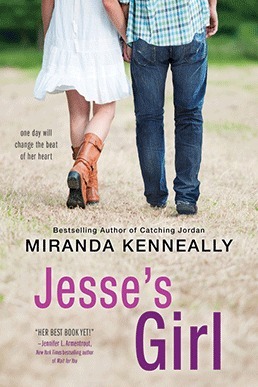 Jesse's Girl was on my "Must Get" list at ALA Midwinter earlier this year. I loved Breathe, Annie, Breathe and was looking forward to this one. Well, Jacque and I have both agreed that we need to take a trip to Nashville because of Jesse Scott. It's been awhile since I've met a boy worthy to add to my Book Boyfriend List, and I feel like Jesse definitely earns a spot. This was a quick and breezy read -- I read the whole thing over the course of a few flights. It also made me want to read Miranda's first book that takes place in the same town, Catching Jordan. I haven't read Catching Jordan yet, but it is definitely on my TBR list after reading Jesse. I just finished reading this book, and I'm joining your Jesse Scott fan club!